William Hagerty speaking about his plans to visit Okinawa at the official residence of the Japanese Ambassador to the U.S. in Washington on July 28. Fifty-seven-year-old businessman William Hagerty will be taking the post of U.S. Ambassador to Japan under the Trump administration. On July 28 Hagerty spoke in regards the standoff between the Okinawa prefectural government and the Japanese government concerning U.S. military bases, including the lawsuit being brought against the central government by the Okinawa prefectural government over unauthorized coral fracturing, seeking to halt construction of a replacement facility for Futenma in Henoko. Hagerty also demonstrated his consideration toward the Okinawa base problem by mentioning that he wishes to express his deep gratitude for all regions that host U.S. military bases. 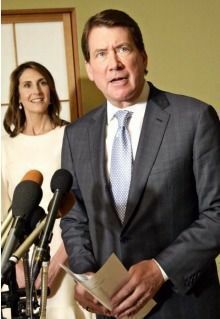 The same day Hagerty attended a reception held to welcome him to the post at the official residence of the Japanese Ambassador to the U.S. in Washington, and appeared at his first press conference following his Senate confirmation. He announced that he will take up his new post in Japan in mid-August. Although the trip has not yet been scheduled, Hagerty said, “I indeed intend to go to Okinawa to visit all of our military installations. ” In gratitude, he expressed his desire for the U.S. military to do what it can for its host communities. Referring to North Korea’s test-launch of a ballistic missile earlier the same day, he said that the U.S. and Japan “stand resolute to confront any threat,” showing his determination not only to intensify pressure on North Korea, but to maintain a strong U.S.-Japan alliance.